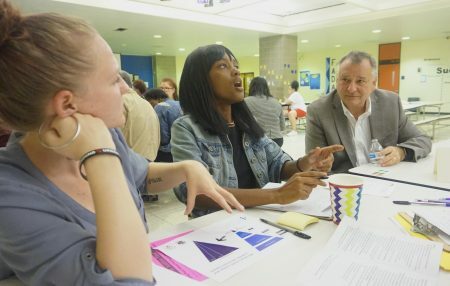 Lunch tables at North Division High School were filled as about 60 people gathered on Tuesday to discuss opportunities for juvenile justice reform in light of state legislation that will close Wisconsin’s youth prisons. In March, lawmakers passed Act 185, which requires Lincoln Hills School for Boys and Copper Lake School for Girls to close by January 2021. Over the last several years, the youth prisons have undergone criminal investigations and been subject to numerous lawsuits for allegations of abuse, neglect and excessive use of force. Key aspects of the way the new law will be implemented have not been decided and will greatly affect Wisconsin’s juvenile justice system. Youth Justice Milwaukee (YJM), a community-based juvenile justice advocacy group, planned and hosted the meeting for Milwaukee residents to learn about and provide input on Act 185 following similar meetings that the State of Wisconsin Department of Corrections hosted in Green Bay, Waukesha and Eau Claire throughout August. “We wanted to make sure that the communities, families and young people most impacted by the juvenile justice system have a voice and a seat at the decision-making table,” said Jeff Roman, co-founder of YJM. Youth from Milwaukee County comprise more than 60 percent of those currently placed in Lincoln Hills and Copper Lake. According to Department of Juvenile Corrections data, black youth made up more than 70 percent of youth committed to Wisconsin correctional facilities, while they are only 10 percent of Wisconsin’s total youth population. “I know at least five friends personally who went to Lincoln Hills and who came out with mental issues, more trauma and things like that,” said 17-year-old Isaiah Lavender, a junior at North Division High School, explaining why he wanted to learn more about the system and the changes being made to it. Representatives from the state DOC and the Milwaukee County Division of Youth and Family Services updated attendees on the implementation plan for Act 185 and sought feedback. State Sen. Lena Taylor and State Rep.-Elect Kalan Haywood II also attended the meeting. What does Act 185 do? Act 185 will not necessarily change how youth are referred to services, but it will change what happens after a young person receives a correctional order and is placed in correctional facility. This occurs when a court adjudicates a young person for an act that would be punishable by six months or more for an adult — a felony offense or a Class A misdemeanor. Today, the young person comes under DOC supervision, and the state provides services. After Act 185, this supervision will be split between the county and the state, according to Shelby McCulley, assistant administrator of DOC’s Division of Juvenile Corrections. To replace Lincoln Hills and Copper Lake, the state will establish a new Type 1 facility — a facility with security mechanisms and surveillance — that will be run by DOC. The facility will hold youth the state deems Serious Juvenile Offenders and youth who were tried as adults in court. In addition to the Type 1 facility, several counties will operate smaller Secure Residential Care Centers for young people who receive correctional orders but are not part of the Serious Juvenile Offenders program. These facilities will give counties more autonomy in how they serve youth with correctional orders, while still being regulated by the state. Act 185 also provides funding to expand the Mendota Juvenile Treatment Center, which will remain under the state Department of Health Services. The size and location of the Type 1 facility has not been decided yet. The regulations for the secure centers are also yet to be determined. Act 185 created two committees to plan how to make the changes. On Sept. 1, the Juvenile Corrections Study Committee recommended programming for young people in corrections, before gathering input in Milwaukee. It will make recommendations about the Type 1 facility on Nov. 1. Seven of the 25 committee members are from Milwaukee, including Rep. Evan Goyke and Sen. Lena Taylor. The second committee is responsible for overseeing grant proposals from counties to fund the various secure centers. The location, size and design of the Milwaukee County secure facility is still unknown, and Mertens said the county is considering different options, including renovating the Vel Phillips Juvenile Justice Center, building a new site or partnering with a local provider that is already providing residential care. “We want it to be a more homelike setting, with a secure perimeter,” he said. Mertens also wants state-of-the-art programming for young people, including a “robust education program,” with an emphasis on hiring and training high-quality staff. “We will be very focused on finding people who know our youth, who can connect with our youth, engage with our youth and … work with us to be a part of treatment,” Mertens said. According to Mertens, the Milwaukee County secure center will not use pepper spray, chemical agents or punitive isolation to control or discipline youth. The environment will aim to be “respectful, safe and relevant” to young people. He said the county is exploring a form of care called the “integrated treatment model” that addresses the emotional and social needs and skills of young people, prioritizing family engagement as well as the impact of trauma. In order to meet the March 2019 grant deadline, the county has formed working groups around facilities, budget, programming, community and the grant. It is also working with consultants from Seattle and the Annie E. Casey Foundation. Following the presentation, representatives from Youth Justice Milwaukee facilitated small group discussions about a set of questions created by the DOC. Both state and county officials encouraged community members to continue providing input after the meeting. “There is no deadline for feedback to be meaningful to us,” said McCulley. 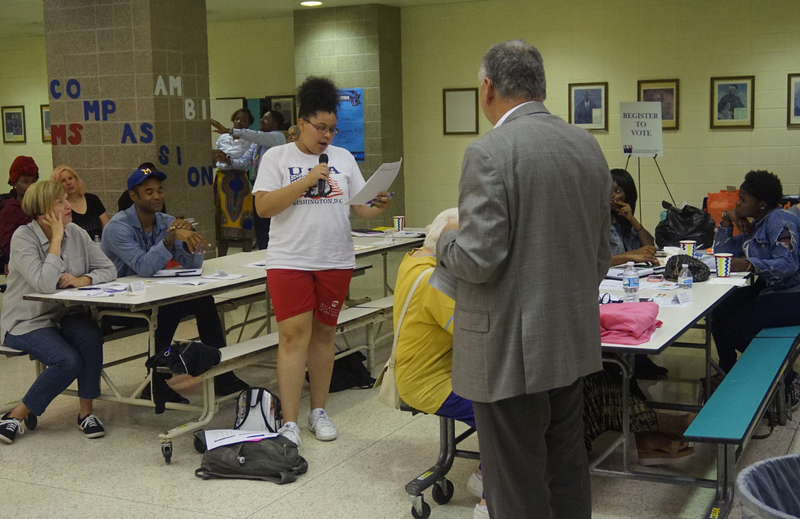 Attendees offered ideas for reforms including more re-entry support, better job training, increased transparency about processes, adequate and accessible mental healthcare, accountability surveys for staff, arts programs, partnerships with schools and increased empathy among staff. “I’m happy that we’re also discussing options outside of youth prisons, whether that be secure residential facilities or improved programs in our community, I want there to be more options,” said Claudine O’Leary, who leads a group of girls in juvenile detention every Friday night and knows most of the young women placed at Copper Lake. Dunn suggested that every young person should have access to a therapist and adults they can confide in, depend on and look up to. Other attendees mentioned wanting the facility to be accessible by at least three bus lines so family members can visit, and a more representative racial and ethnic makeup of staff members.